The cumulative contest is a contest used at the L$1 to L$9 games. 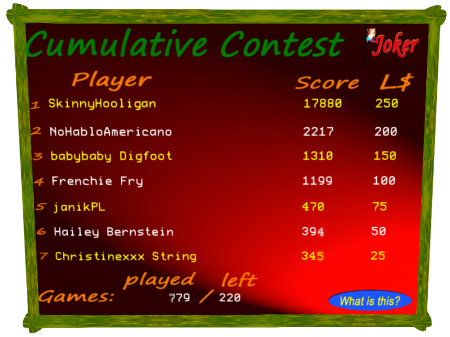 The cumulative contest is a contest that runs for 999 games. It gives a prize to the 7best ranking players, the first prize of course the highest and the 10th the lowest. The prizes are visible on the contest board. So if you play a L$3 game, your score counts 3 times heavier as a L$1 game. (Thus if you play L$3 by playing 3 times a L$1 game, it is the same as one L$3 game). You should take into consideration the playing of others. Try to get the best spot, at the lowest costs.